Huang Cho Rebellion - The Huang Cho Rebellion (known in China as the Huang Chao Revolution) was essentially a ten year civil war (874-884) which, for all intents and purposes, dealt the death knell to the Tang Dynasty. At its height, the Tang was one of the most powerful empires in the world; but by the late ninth century it was falling apart. Power was decentralized into feudal regions, peasant farmers were severely impoverished and taxes were burdensome (a common thread in many revolts). The only thing missing was a leader. He came in the form of Huang Chao (actually there were two. The other was Wang Xianzhi, but he died less than halfway through the revolt). Huang Chao was a salt merchant (as was Wang Xianzhi), which may not sound like a romantic profession, but the salt industry had been monopolized by the Tang government since the An Shi Revolt, and Huang Chao operated on the black market. He got wealthy as a result, and used his money to raise a citizen army and equip it. The uprising actually began in 874 under Wang Xianzhi but struggled initially. When Huang Chao joined Wang Xianzhi the following year the tide began to turn. However the two men did not have a common vision and they split after about a year. Huang Chao marched into Central China and began wreaking havoc. While technically still a united kingdom, the Tang Empire had broken down into prefectures where local lords tended to have more power than the emperor. In 877, Huang Chao captured the Yin Prefecture, pillaged the Qin and Huang Prefectures and besieged the Song. But in the summer of that year, a Tang general named Zhang Zimian arrived and lifted the siege on Song. By the end of the year, a second general, Zeng Yuanyu, arrived and forced Huang Chao to withdraw. 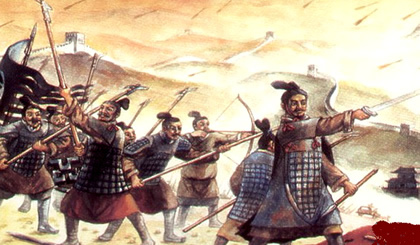 In the spring of 878, Zeng Yuanyu turned on the other rebel army and crushed it at Huangmei. Wang Xianzhi was killed in the battle. The survivors who escaped joined Huang Chao. Hoping to end the revolt, Emperor Xizong offered to make Huang Chao a general in his army if he disarmed and turned himself in. Chao refused, possibly sensing a trap. Instead, he marched south, crossed the Yangtze River and captured several more prefectures. The imperial army caught up with him, though, and two Tang officers, Zhang Lin and Liang Zuan defeated Huang Chao and liberated the prefectures. Gao Pian, who was their superior officer, was appointed overall commander by the emperor, and charged with ending the revolt. This development caused several of Chao's officers to surrender. His situation became more desperate, so he marched toward Lingnan, in the deep south of China (the region just north of present-day Vietnam). Things got worse for him though. Disease swept through his army (which disease is not known) and killed about a third of his men. Under advice from his officers, he decided to travel back north. He circumvented the Tang army by building rafts and sailing down the Xiang River (a tributary of the Yangtze). Landing in the Tan Prefecture in the winter of 879, he captured it in a single day. But it was obvious Huang Chao did not have the strength to hold territory. As soon as the Tang army caught up with him, he had to withdraw to a neighboring prefecture. Understanding his predicament, Huang Chao tried to buy his way out of trouble. He offered a bribe to his pursuer, Zhang Lin, and wrote to Gao Pian attempting to do the same. Gao Pian was receptive, but the conditions he offered Huang Chao made Chao think he was being led into a trap (again). Negotiations ended and, sensing victory, Gao Pian ordered Zhang Lin to attack Huang Chao in the spring of 880. To almost everyone's surprise, Chao won a smashing victory, killing Zhang Lin in the process. This changed everything. The Tang Empire was suddenly thrown on the defensive and Huang Chao went on offense. He captured the Xuan Prefecture in the summer of 880. With the loss of his top general, Gao Pian was panicked. He appealed to Emperor Xizong for help. This, in turn, resulted in panic in the Tang capital. Huang Chao learned of the chaotic state of the empire and immediately marched on Luoyang and Chang'an at the end of 880. Emperor Xizong dispatched an army from Chang'an under the command of Qi Kerang with orders to defend Luoyang. He then sent a back-up force to guard Tong Pass, which was the route between Luoyang and Chang'an, should Luoyang fall. Well Luoyang did fall...and quickly too. Qi Kerang survived and withdrew his remaining forces to help defend Tong Pass. But his men were hungry and exhausted, and the original force defending the pass was ill-equipped. They withstood Huang Chao for more than a day, but then resistance collapsed. With no one left to defend the capital, Emperor Xizong fled, and Huang Chao entered Chang'an in early 881, declaring himself emperor of the new Qi dynasty. Top imperial members who stayed were executed (those of lower rank who swore loyalty were allowed to live and continue serving in their capacity), and Huang Chao rewarded his officers with appointments to his new court. He declared his wife, Lady Cao, empress. However, the new dynasty had hardly secured its hold over Chang'an, let alone the outlying area. Forces dispatched throughout the neighboring region, were met with resistance. 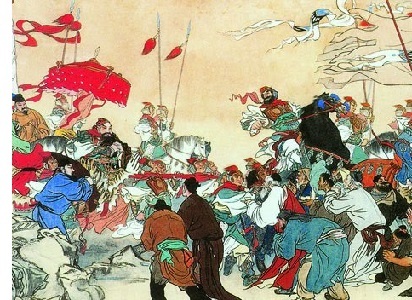 One governor, Zheng Tian, of the Fengxiang Prefecture destroyed the Qi army sent to his province in the spring of 881. This emboldened other governors to fight back as well, and in the summer of 881, Chang'an was surrounded by enemy troops. Residents in the city who opposed the new dynasty revolted. But the Qi army successfully defended the city and the revolt was crushed. Huang Chao punished the residents of Chang'an by carrying out mass executions. Meanwhile, Emperor Xizong made his headquarters in Chengdu and was preparing a counter-attack. In the spring of 882, a renewed Tang army converged on the capital. It besieged the city and eventually starved it into submission. Huang Chao managed to escape and fled east. He tried to set up a new capital in the Cai Prefecture, but was eventually trapped between the army defending the Cai and the Tang army pursuing him. Huang was killed in the summer of 884, and after ten years, the revolt came to an end. Although the Tang Dynasty was briefly restored, within a couple decades, it broke up for good into what became known as the Five Successive Dynasties and Ten Independent Kingdoms.